Turn it on-bugs gone! 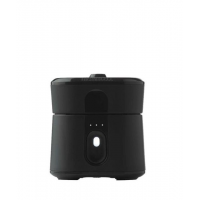 The Thermacell MR300 Portable mosquito repeller effectively creates a 15 sq. ft. mosquito-free zone that can be taken virtually anywhere outdoors to repel pesky mosquitoes. The Thermacell Patio Shield mosquito repeller provides a 15 ft. mosquito protection zone-just turn it on and mosquitos are gone. With no scent, smoke or mess, it's ideal outdoor entertaining. Mosquito protection at the push of a button, with no messy lotions, sprays, scents or DEET? Right this way. The Thermacell Radius Zone Repeller 1.0 treats the area around you, rather than your skin. Beat the worst mosquito pressure with one touch of a button. The second-generation Thermacell Radius mosquito repeller boasts longer runtime, optimized repellency and one-button controls. Thermacell Radius Repeller Refill - 12 hrs. As effective on your backyard patio as it is in remote wilderness, the Thermacell Radius Repeller refill can be used with the Thermacell Radius (sold separately) to repel mosquitoes for up to 12 hrs.